October has been a great month in the peer to peer lending world. 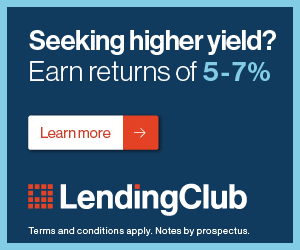 Prosper and Lending Club are seeing record volumes and returns are still very solid for us investors. As you subscribers know(Subscribe here to follow my returns), I have a total of 20 loans: 8 Prosper loans, 11 Lending Club loans and 1 private loan that I also track since I use the same Credit Analysis methods there that go into my analysis and loan selection here. I don't believe in the $25 per loan over a zillion loans philosophy. I am so happy with my returns and portfolio performance that I have added $1000 to my Prosper account and so far have purchased 2 new loans. Both are on a 3 year term and 1 is an A rated loan and 1 is a C rated loan. Also, I made another private loan to a local business that I know for a piece of equipment in the amount of $1700. The Prosper loans have not started to earn interest yet and I have some cash still waiting to be deployed, so like usual, I will be counting that as zero interest earned in my ROI calculation where I look at Interest Earned/Principal balance remaining on loans. What are you noticing out there in the investing landscape? Please let me know by commenting below. Have you signed up for the prosper.com affiliate program? hi Ron, yes I have but i don’t really market it as i want people to see that the info on Prosper is not based on me wanting to get people to sign up there.